This shows what is known as a sun relief map of the previous data cropped slightly closer to provide better definition of the central area. It gives a visual interpretation of the data as if the sun were shining at an elevation of 25 degrees, from an angle of 225 degrees. This illuminates certain features, as if observing when the sun is low on the horizon, and is a method of seeing detail which might otherwise be missed, by the accentuation of the shadows. The filter has emphasised the man made ditches running parallel to the fort on the right hand side, indicating that they also run around the southern end towards the inlet, viewed on the left hand side. The Roman track is still visible across the top right and the building in the centre of the fort is very evident and clearly not a geological feature, which the high pass filter would remove. 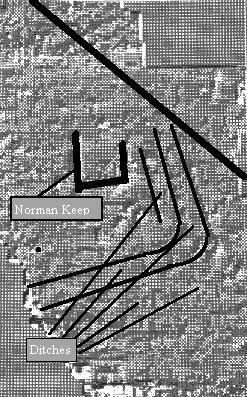 Due to it’s central position in the middle of the Norman fort it is impossible not to reach the conclusion that this may be the first Norman keep. Having studied documents that suggest that Norman architecture prior to 1094/5 was wooden in construction this “building”, as it appears to be raises more questions about the site than it answers at this stage.